Get a taste of driving a full size standard gauge steam locomotive in the beautiful surroundings at the Royal Deeside Railway. For anyone who has a passion for the age of steam, this taster driving experience is not to be missed. and makes an ideal Christmas present with a difference. You’ll learn to drive 'Bon Accord', an Andrew Barclay standard gauge 0-4-0 steam locomotive, built in 1897, along the length of the Royal Deeside Railway. 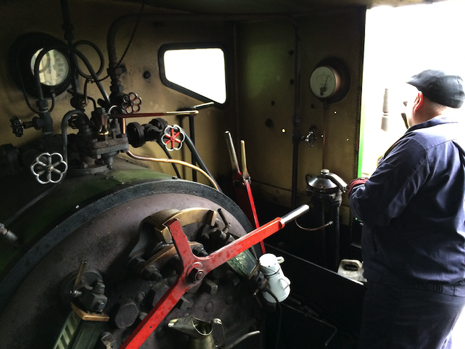 Upon arrival at the railway, you will receive a short safety briefing, and then you will be directed to the footplate of the steam locomotive. Here you will be met by an expert instructor who will guide you thoroughly through the controls and explain their use in driving the steam engine. Once he feels you have gained sufficient confidence, you will take complete control as you drive the full length of the line. Your instructor will remain with you for guidance throughout, and the instruction is all one-on-one, so you will have his full attention at all times. This is a unique experience, something really special that will make the gift of a ticket a present to remember. The experience will last 45 minutes, and if you so wish, up to five guests can join you at the railway to witness the experience, riding in the attached brake van with a good view of the loco cab. All trainee drivers receive a laminated colour certificate of their experience to keep as a souvenir. Obviously, the cab of a steam locomotive is not the cleanest of places. The railway will provide protective gloves, however it is suggested that ‘sensible’ clothing is worn i.e. no open-toe shoes, shorts or short sleeves. If you are interested in organising a coroporate event where more than two people experience the chance to drive a full size steam locomotive, then please contact our Charter Organiser by clicking HERE. 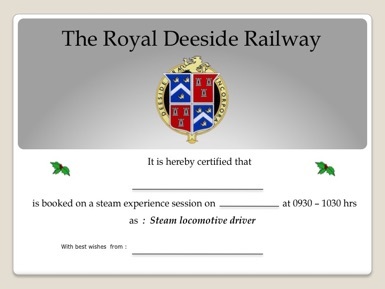 A certificate is supplied by email at the time of booking, which you may wish to print out and include with a card if the steam driving session is intended as a gift. The driver will also receive another certificate on completion of the session, as shown below. All trainee drivers also receive a laminated colour certificate as a souvenir of their experience. Please note, a maximum of two persons per session can be accommodated due to footplate space restrictions. to ride in the attached Brake van. Please note that any changes to bookings will incur a fee of £5 to cover administration costs, payable over the shop counter on the day of your visit. Changes to the date cannot be made within 14 days of the booked date.